At the start celebrations were focussed on the Hill of Tara. That has changed over the years as it was felt that we needed to extend our horizons. Nowadays, Tara Celebration's venues are generally in Meath and the eastern side of Ireland - but there is always the understanding that, as all land is sacred, we do not limit our boundaries and, occasionally, we go wider afield. Akahista, West Cork - Summer Solstice 1. An Tobar, Ardbraccan, Meath - Winter Solstice 1. Summer Solstice 1. Autumn Equinox 1. Ardmulchan, Meath - Spring Equinox 1. Athboy (Hill of Ward) - Samhain 1. Bective, Meath - Samhain 1. Imbolc 2. Spring Equinox 2. Bealtaine 1. Summer Solstice 1. Autumn Equinox 1. Burren, Clare - Lughnasadh 1. Clogherhead, Louth – Spring Equinox 1. Dowth, Meath – Samhain 2. Winter Solstice 2. Spring Equinox 1. Autumn Equinox 2. Fourknocks, Co. Dublin – Samhain 1. Winter Solstice 1. Imbolc 2. Spring Equinox 2. Bealtaine 1. Lughnasadh 1. Autumn Equinox 1. Gormanston, Meath – Samhain 1. Loch Ramor,Virginia, Cavan - Spring Equinox 1. Loughanleagh, Cavan - Lughnasadh 1. Loughcrew, Cavan – Samhain 1. Lough Derravragh, Westmeath - Bealtaine 1. Mornington Beach, Louth - Autumn Equinox 1. Mullaghmeen Forest, Westmeath - Spring Equinox 1. Navan Ramparts, Meath - Summer Solstice 1. Newgrange, Meath - Winter Solstice 4. Old Mellifont Abbey, Louth – Samhain 1. Port Beach, Louth -Lughnasadh 2. Rath Lugh, Meath – Samhain 1. Ravensdale Forest, Louth - Imbolc 1. Seomra Tara, Killeen, Meath (no longer open to the public) - Winter Solstice 1. Autumn Equinox 1. 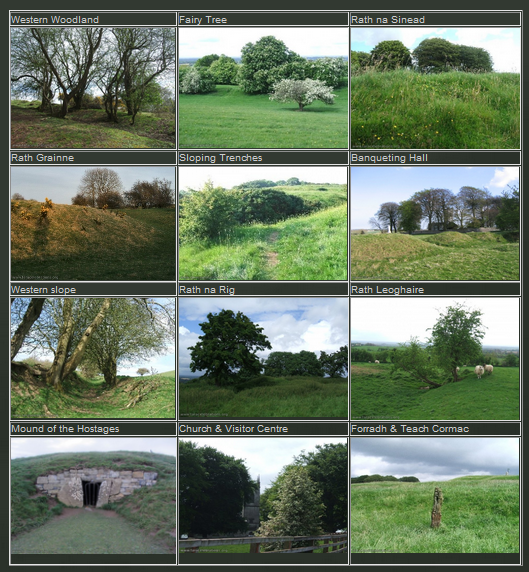 St Ciaran's Well, Meath – Bealtaine 1. Lughnasadh 1. St John's Well, Meath (no longer open to the public) - Bealtaine 1. Summer Solstice 1. St. Gobnait's Well, Cork - Lughnasadh 1. Tara, Meath – all 8 festivals many times. Teltown, Meath - Lughansadh 2. Tower of Lloyd, Kells, Meath - Imbolc 1. Zurich, Switzerland - Samhain 1.